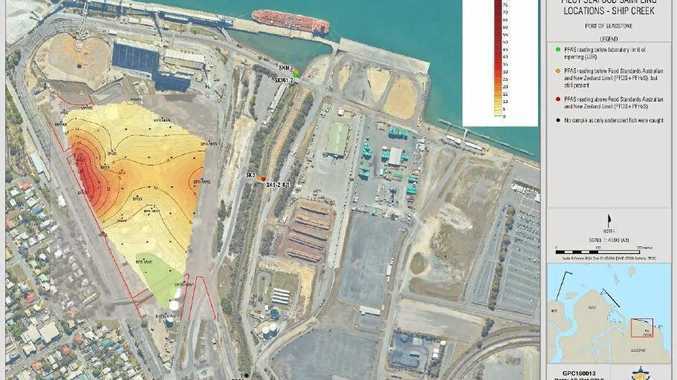 TRACES of per and poly-fluoroalkyl (PFAS) substances have been found in fish at Ship Creek, Gladstone Ports Corporation has revealed today. The results were from a GPC initiated voluntary water monitoring for per- and poly-fluoroalkyl substances at its three port precincts. Validation sampling indicated a number of these sites returned elevated levels of PFAS when compared to national guidelines, prompting GPC to initiate a broader scope of sampling. This involved undertaking a pilot seafood sampling program at Ship Creek within the Port Central precinct. Sampling was undertaken in accordance with the Queensland Health: Guideline for sampling and analysis of seafood suitable for human health risk assessments of PFAS contamination. The results indicated traces of PFAS above national standards in four fish caught at one location in Ship Creek. The Gladstone Ports Corporation said it wanted to assure residents that these results do not relate to water connected to town supplies nor is it a waterway used for commercial fishing activities. In addition to this, sampling in the surrounding harbour did not return elevated levels, indicating it may be a confined issue. GPC has alerted Queensland Health and the Department of Environment and Science. GPC said there is currently no consistent evidence that exposure to PFAS causes adverse human health effects.
. The public should avoid consuming fish from Ship Creek until the results of validation testing are received. However, infrequent consumption (every few months) of a meal of seafood (75 grams for children up to six years and 150 grams for the rest of the population) from the creek should not present a health risk.
. Fish is an important part of a healthy diet.
. The public are reminded that consumption of most species of fish from other areas should be limited to 2 to 3 serves per week in line with advice on mercury in fish published by Food Standards Australia New Zealand, where a serve is 75 grams for children up to six years and 150 grams for the rest of the population.
. Anyone concerned about their health should talk their doctor or call 13HEALTH (13 43 25 84). While GPC is not the source of the contaminant, it is committed to taking a proactive approach to ensure the environment it operates in is preserved and that the community continues to be kept informed of investigations. GPC and the Queensland Government are working together with port entities to determine the next course of action.